IAN SMILLIE, Diamond Development Initiative. Chaired by STEPHEN BROWN, University of Ottawa. As debates rage about the responsibilities of business and government in global extractives industries, there remains a significant lack of empirical research and theoretical analysis focused on the dynamics of resource extraction, governance and corporate social responsibility. 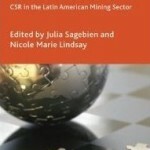 This collection takes a broad, ‘governance ecosystem’ view to exploring the complex and crosscutting relationships between key actors involved in and affected by mining governance in Latin America.